There was a lot of thought put into the “A New Beginning” shirt. I knew that the rebirth of Sotare had to be special. At the same time, I knew the rebirth was going to start off small and grow slowly. The first shirt needed to encompass everything the brand stood for, but not in a boring way. It had to be something intriguing, something captivating, something that held attention. The original idea was to have a picture of Joey sitting on top of a mountain, looking over a valley of creatures, with UFOs in the air, the Washington Monument in the background, and more. The picture would be cropped to the shape of the Leaping Kangaroo logo. I realized that making the picture fit inside the kangaroo logo would detract from detail and create a frustrating image, so that idea was abandoned. 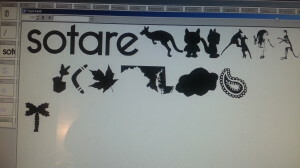 Then the idea come to create icons for the future Sotare releases, and arrange the icons to create the Leaping Kangaroo. This took a few hours to complete. First off, I took the icons and turned them into a font called Sotare Webdings, this way I had scalable versions of each icon. Then was the painstaking process of arranging, scaling, and rotating all the icons in a fashion that would create the Leaping Kangaroo. I kept a hidden layer of the kangaroo outline so that I could check the progress from time to time. After a few days, the design was basically finished. Once finished it was time to add color to all the icons. I kept things in a limited color pallet, the basic Sotare pink and blue, and then some green to make things less monotonous. Then to prep for printing the design was flattened into three layers- one layer for each color. After this I emailed the design to my printer and a few weeks later had a box of rad shirts at my doorstep! Any questions on the design process? Any way I can give you tips? Hit up the comments or shoot me an email! Feeling lost in the rubble of failure. You bring yourself out from beneath the avalanche of mistakes to survey the scene. Broken dreams shipwrecked and wailing for rescue. A bright light pierces through the clouds, giving you a glimpse of your glorious future. Now is the time to begin anew. This is the starting line. This is reinvention. You can create the world of your dreams. Will you take a chance? Will you leap forward into the unknown? This is a new beginning for Sotare, a new beginning for me. This is the doorway to a brand new world, a brand new experience. 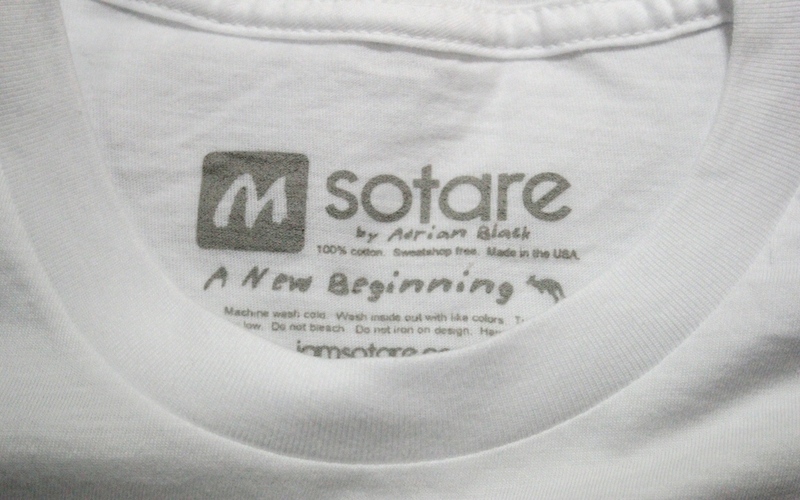 “A New Beginning” commemorates the relaunch of Sotare. 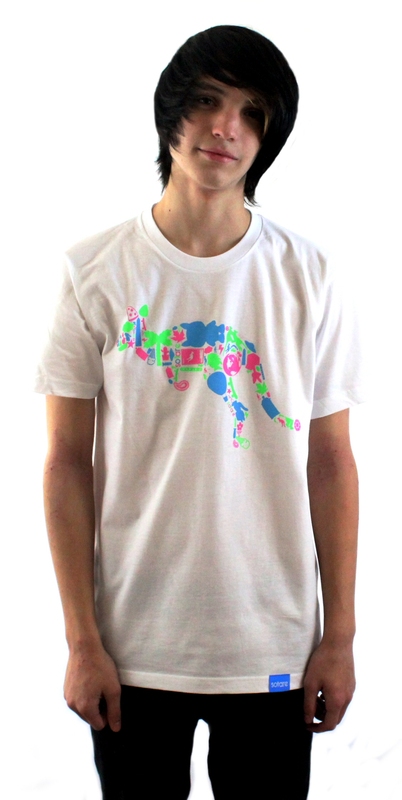 This shirt is the very first release in our rebirth. 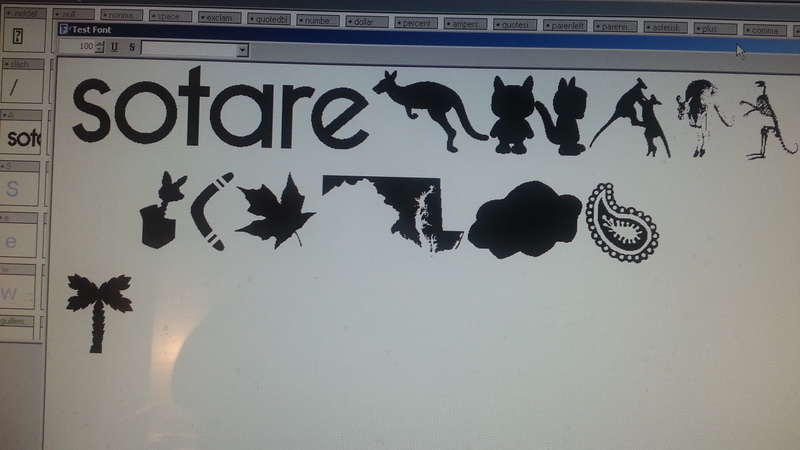 Like a preview, the design features various icons surrounding future Sotare releases. Silhouettes of kangaroos, cacti, guitar amps, guitar picks, ufos, and even the Washington Monument are arranged to created the shape of the Sotare leaping kangaroo. What do all these things have in common? Stick around to find out. 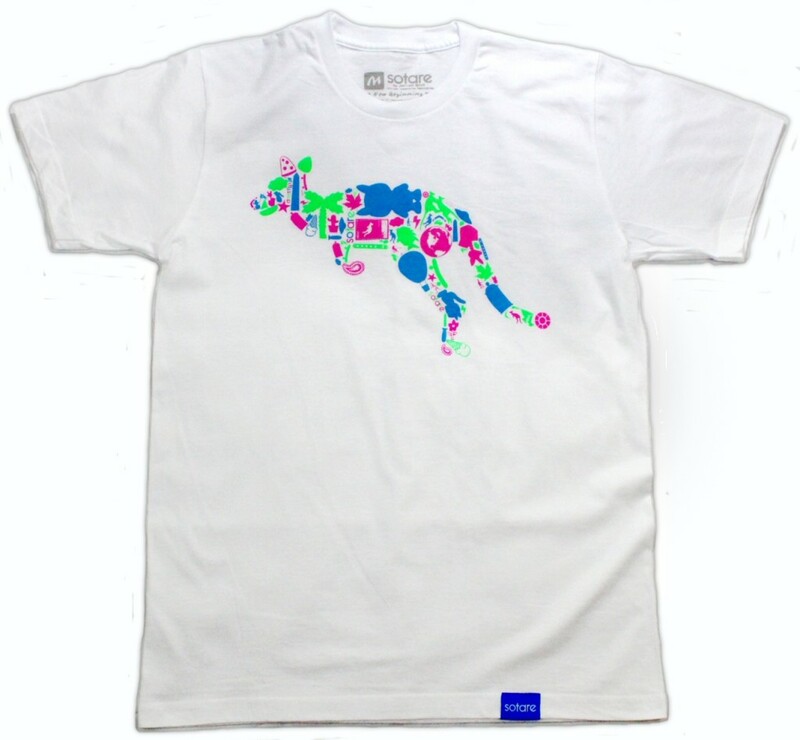 The blue, pink, and green design is screen printed on a white, soft, sweatshop free, American Apparel ring spun cotton tee. 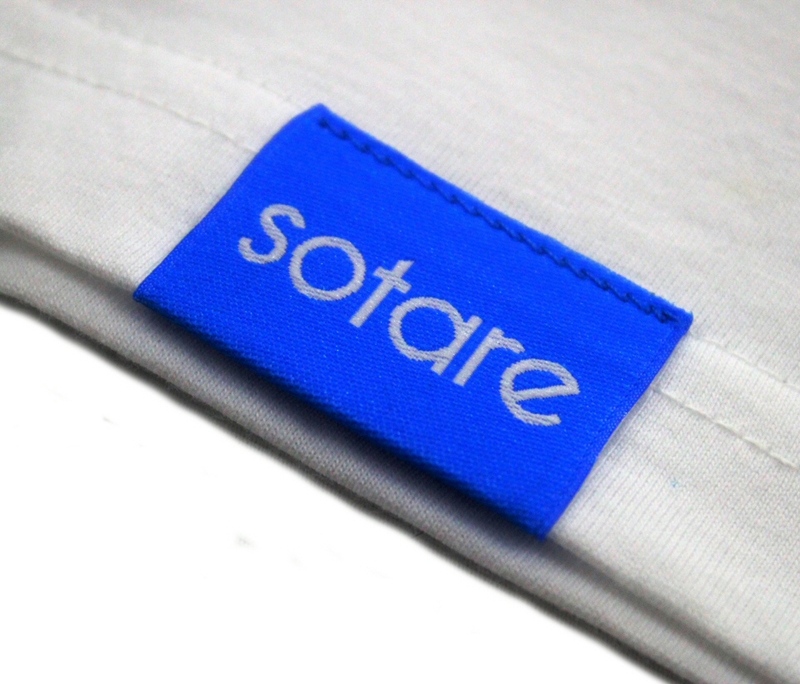 The shirt is adorned with a blue hem-tag, emblazoned with the Sotare logo. Are you brave enough to join me on this journey? Are you willing to be my traveling companion as we leap into this new world of bright colors and patterns? The time to start over is now. “A New Beginning” is currently on sale exclusively at iamsotare.com. I’m exuberant with joy to announce the official launch of Sotare! This is the beginning… A new beginning. Something new has now arrived to the forefront of the world stage. 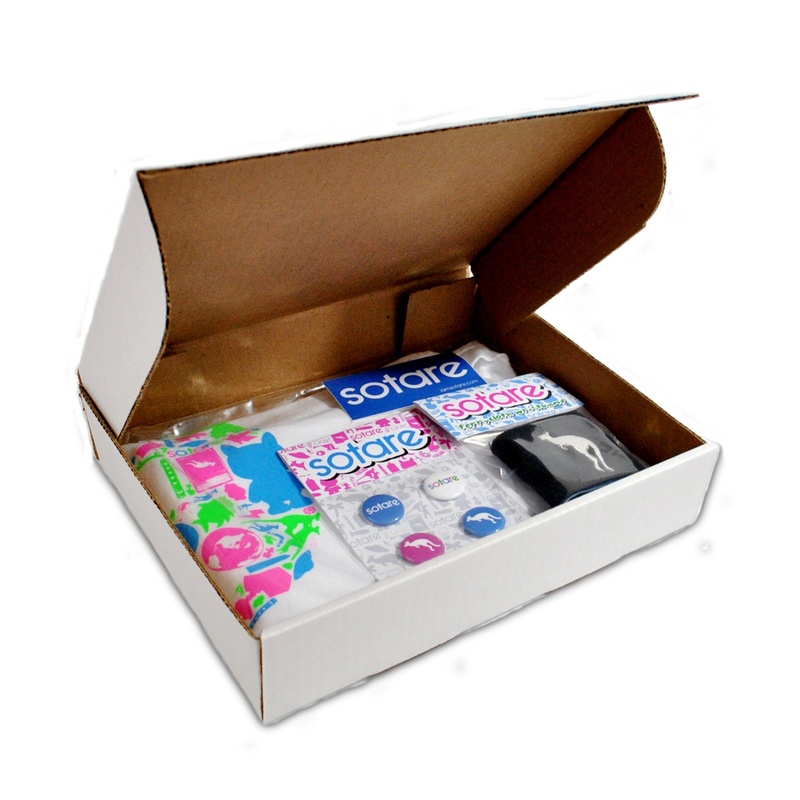 Sotare is not just a clothing company. This is not just an art brand. Sotare it is an idea. It is infinite and limitless. It is all you make it to be. You are Sotare. You are empowered. You can change this world. You can invent the future. Let’s journey together to make this world a better place. To commemorate the beginning of our adventure, check out the Sotare store. For a limited time, we have created 10 Launch Packs, for $25 each. They include A New Beginning shirt, a terrycloth wristband, a sticker, a free button pack, and more! I hope you stick around for this journey. I hope you join me as we travel through this new world together! If you are reading this, you have just come across the beginnings of something special. Like the dust on a trunk of buried treasure, this is the starting point of discovery. A grand new world awaits… but what is this world? What is this place?